With more secrets of alien atmospheres being revealed and building a better understanding of the mechanics of how planets and orbits form, the last month has been particularly important in the world of planetology. On that note, the Exoplanet Catalogue now counts 3610 planets in 2704 systems. May has seen some noteworthy discoveries in the world of palaeontology as well, including the unearthing of the earliest known land-dwelling lifeforms. Vouivria damparisensis is the earliest known brachiosaurid. On May 2, a team of researchers from London’s Imperial College decided to re-examine a 160-million-year-old fossil discovered some 80 years ago in France. They confirmed that the previously unknown fossil belongs to one of the earliest relatives of the famous brachiosaurus, a family of sauropod dinosaurs that evolved alongside the other major dinosaur families in the Late Triassic. Dubbed vouivria damparisensis, the sauropod is estimated to have weighed around 15 tonnes. The Larsen C ice shelf continues to break apart. Back in January, the media reported that the breakaway of Antarctica’s Larsen C ice shelf was imminent. On May 2, the rift had developed a second branch, moving in the direction of the ice front. The main rift is already 110 miles (180 km) long, making the breakaway region the largest iceberg ever known. Unsurprisingly, manmade global warming is often cited as being the first culprit. Researchers also say that the rift will leave the remaining ice shelf even more vulnerable. Chenanisaurus was, in many ways, like a smaller version of North America’s tyrannosaurus rex. Until the Cretaceous-Palaeogene mass extinction 66 million years ago, dinosaurs dominated just about every terrestrial ecological niche on Earth, Africa included. On May 3, palaeontologists revealed a previously unknown species, known only from a recently discovered fossil in a phosphate mine in Morocco. Named chenanisaurus barbaricus, the dinosaur was a theropod like the tyrannosaurus rex. However, unlike the T-rex, there is no evidence that the chenanisaurus had any feathers. The earliest known land-dwelling life lived in boiling hot springs like the one shown here in Iceland. A discovery published by the University of New South Wales on May 9 revealed the oldest evidence of land-dwelling microbial life, dating back some 3.48 billion years. This pushes the previous estimate back some 580 million years, meaning that life first migrated onto the land far earlier than thought. The fossils were discovered in deposits left behind by ancient hot springs, which also pushes the evolution of heat-loving extremophiles back a further 3 billion years than previous estimates. The seven known planets of the TRAPPIST-1 system all orbit in perfect harmony close to their host star. Back in February, the discovery of planets in the habitable zone of TRAPPIST-1 hit the headlines all over the world. However, the large number of planets in a relatively small area baffled scientists as they tried to explain how their orbits were stable, preventing them from crashing into one another. On May 10, a team of astrophysicists from the University of Toronto revealed the unusually rhythmic way that the planets stay in orbital resonance with one another to remain stable. The fact that gas giant planets can form so close to their host stars has long puzzled astronomers. The ability to analyse atmospheres on planets many light years away gives us incredible insights into their formation while also being a crucial factor in the search for extraterrestrial life. On May 11, researchers from the University of Exeter revealed findings of a primitive atmosphere on a so-called ‘hot Neptune’. The atmosphere, which contains large amounts of water vapour, also offers important insights into how gas giant planets can form so close to their host stars. 4 billion years ago, Mars was much more like Earth is today. Mars wasn’t always a barren desert world. Some 4 billion years ago, at a time when the chemistry of life on our own planet was just getting started, the Red Planet was likely home to a water cycle similar in many ways to that of Earth. Mars’s Hesperian Period saw widespread flooding and, according to a study published on May 16, this was caused by heavy rain. Early Mars had a much thicker atmosphere and higher air pressure than it does today, allowing rain to profoundly shape its landscape. 2007 OR10 is the third-largest of the Kuiper Belt dwarf planets. Lying over twice further away than Neptune, 2007 OR10 resides in the Kuiper Belt. With a diameter of 930 miles (1,500 km), it’s the largest known object in the Solar System that doesn’t have a name. Astronomers confirmed on May 18 that the object has a single moon that’s up to 250 miles (400 km) wide. As with Pluto and its unusually large moon, the 2007 OR10 system was likely caused by a collision event between two similar-sized objects when the solar system was forming. The unusual dimming of Tabby’s Star could be due to a swarm of comets. 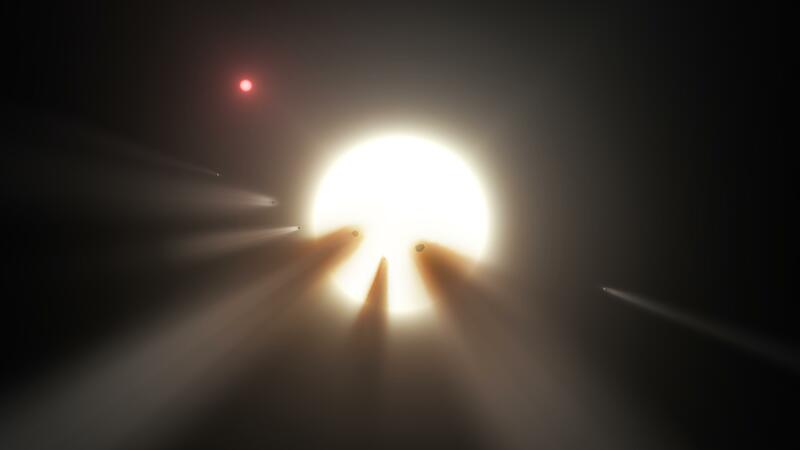 Tabby’s Star has been confounding scientists ever since they first noticed its unusual light fluctuations back in September 2015, leading some hopefuls to believe it might be home to an alien megastructure. On May 20, observers reported that the star’s light was once again dipping enough to have astronomers scratching their heads once again. The cause remains a mystery, although the most likely explanation is that a swarm of comets passing in front of the star is causing the fluctuations. When built, ELT with be the largest optical telescope in the world. On May 26, the first stone was laid for the construction of the European Extremely Large Telescope. The ELT, which was greenlighted in 2014, is scheduled for completion in 2024, when it will become by far the largest optical and infrared telescope in the world. The 10,000-foot-high (3,000m) summit of Cerro Armazones in Chile’s Atacama Desert was chosen for construction of this remarkably ambitious observatory, owing to its lack of light pollution and cloud-free skies.